Recommended to: Fans of quick moving novels with vivid characters and true to life situations. Whoa. 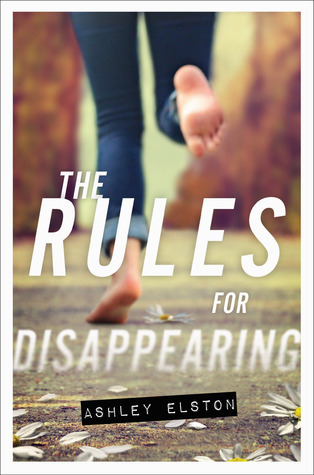 I'm not sure how else to describe The Rules for Disappearing in just one word, except to start with that. Madeline, Olivia, Meg; call her what you will but our main character is definitely one strong female. Constantly shipped from place to place, sometimes without a moments notice, her life isn't easy. What Ashley Elston builds is a world where a family is on the run, and our main character can't remember why. All that matters is survival. I have to say that I never really pondered how tough the Witness Protection program could be. I loved reading from Meg's perspective because she wasn't one to sugar coat anything. I met a girl who was so strong, that she would shun real life if it meant keeping her sister safe. A girl who has been so many different people in such a short amount of time, that she can't recall what parts of her are real anymore. Meg is real. She's raw. She's honest. That's what makes this such an amazing read. It helps of course that we have a swoon-worthy male lead as well. Ethan Landry is the southern boy we all wish we had. Sweet, smart, and absolutely stubborn, I couldn't help but adore his character. What really impressed me was how Ashley Elston brings these two together. From the moment they meet, there is tension. How do you hide your past and still let someone else in? Watching Ethan and Meg dance around the truth is maddening and intriguing at the same time. While Meg definitely made some decisions I didn't agree with, and I won't deny physically yelling at the book, everything weaves together into one fantastic story. There is the element of mystery surrounding Meg's situation, the tension filled romance with Ethan, and even a few funny moments. I all but devoured this book, and highly suggest you go and do the same.